This stone is such a pretty color. At Ventures - Gifts for Good in Pike Place market they can not keep necklaces and earrings I make with lapis in stock. I recently made a few new designs for them and these beauties are now available there. The name of this stone comes from 'lapis', the Latin word for stone, and 'azula', which is Arabic for blue. This opaque, deep blue gemstone has a grand past. It was among the first gemstones to be worn as jewelry and worked on. At excavations in the ancient centers of culture, archaeologists have again and again found among the grave furnishings decorative chains and figures made of lapis lazuli – clear indications that the deep blue stone was already popular thousands of years ago among the people of Mesopotamia, Egypt, Persia, Greece and Rome. Healing : Lapis lazuli is beneficial to the throat, larynx, and vocal chords, and helps regulate the endocrine and thyroid glands. It enhances circulation and improves cardiac rhythm. It reduces vertigo and lowers blood pressure, and is thought to alleviate insomnia . Lapis lazuli is also thought to relieve general pain and inflammations, and is especially effective against migraine headaches. It aids the nervous system and brain disorders, and is believed to help with attention-deficit, autism and Asperger's syndrome. Mystical: Lapis lazuli is one of the oldest spiritual stones known to man, used by healers, priests and royalty, for power, wisdom and to stimulate psychic abilities and inner vision. It represents universal truth. It quickly releases stress, allowing for peace and serenity. It permits tapping into personal and spiritual power. As always stone information is not meant as medical advice but provided here for curiosity only. 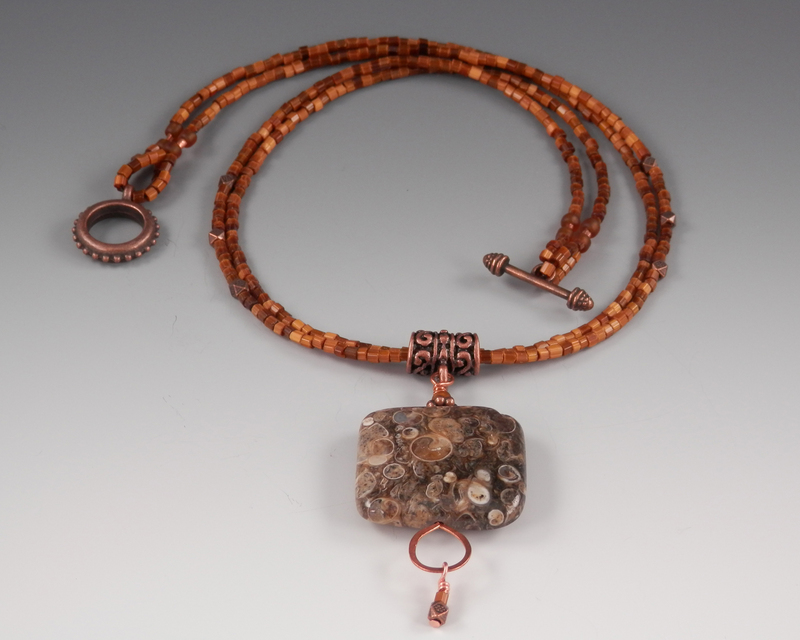 In Hood River Oregon you will find a brand new boutique called Tacy's Place that is now selling Beadware's turritella agate necklaces and earrings. Tacy's opened for business at this July and is having a grand opening celebration on October 1st. Nestled along the Columbia River Gorge, Hood River is a great place to visit. So many wonderful things to see and do including viewing the many waterfalls, visiting the Columbia River Discovery Center, hiking, watching kite boarders and wind surfers on the river, wine and beer tasting and shopping. Be sure and stop in to Tacy's if you are in the area! I have never met a snakeskin jasper I did like like. They are gorgeous stones. The patterns and colors are amazing. This one had a cool crystal inclusion. It sold on its first day on display. Blue/grey seed beads and sterling silver tubes with pewter. Snakeskin jasper is a stone of protection and invisibility. Who doesn't need that! Mixed with freshwater pearls and copper.One on right has SOLD. New Places to Find Beadware - California! Starting this month you will be able to find Beadware stone necklaces and earrings at Enduring Comforts in Freestone California. Besides jewelry, this charming boutique carries antiques and other delights. Beside jewelry, you will find clothing, gifts and a tasteful selection of antiques for your home. You can see pictures of this lovely shop on their Facebook page. If you are cruising down the Bohemian Hwy on the Sonoma Coast on a Friday thru Monday be sure to stop in! The Angeline Spa at Clearwater Casino in Suquamish, WA has carried Beadware in their gift shop for several years now. I love taking up my boxes of inventory for their staff to choose pieces that will best fit their customers. They carry the most diverse selection of my work of any local shop. This month you will find amethyst, pietersite, ocean jasper, turritella agate, flourite, rose quartz, snakeskin jasper and labradorite. This summer they have added earrings and bracelets to their selection of necklaces. The Spa offers mid-week specials, with September's special being your choice of a herbal body wrap or brightening facial. Click here to learn more! Another shop that is now carrying Beadware is Millstream - Gifts from the Pacific Northwest in Winslow on Bainbridge Island. This beautiful shop has been around for more than 30 years and has made a name for itself featuring a wonderful selection of fine art and nature related gifts that reflect the spirit of the Pacific Northwest. They now carry a selection of Beadware stone pendant necklaces and earrings, including some of my popular fossil collection. Oh my have I really not posted since May!? Lots of new things happening with Beadware. This month I attended my first wholesale gift show. As a result Beadware will shortly be found in a number of new locations. I will feature some of them here as the orders are delivered. My first order at the show was from Ye Olde Curiosity Shop. This family owned store has been on the Seattle waterfront since 1899, and no that is not a typo!! Before the Space Needle. Before Woodland Park Zoo. Before the Seattle Aquarium. Even before the automobile replaced the horse and buggy, there was Ye Olde Curiosity Shop! When Joseph Edward Standley set up his curio and souvenir shop on the waterfront in 1899, Seattle was a rough ‘n’ tumble town. The city was still reeling from the Great Fire only ten years before, and the newly replaced wooden docks rang with the footsteps of timber laborers, mine workers, and wannabe gold prospectors headed to the Alaska Yukon. Those footsteps usually took people down to Ye Olde Curiosity Shop, and in greater and greater numbers throughout the years. The lumberjacks changed to office workers and world travellers, but they all wanted to know: where else could a body see a walrus skull with three tusks, buy a miniature totem pole, and touch the vertebra of the world’s largest whale? Local and international visitors alike found “1001 curious things” in Daddy Standley’s free museum. As they will today. Over the course of five generations, the collection has done nothing but get more interesting. The ongoing stewardship of Standley’s family has brought shrunken heads, mummies, natural oddities, taxidermy treasures and manmade wonders from all over the world into the shop. Ye Olde Curiosity Shop plays host to more than a million visitors a year these days, and many are on a return trip, eager to share the experience with their great-grandchildren. They now carry a small selection of Beadware earrings. The shop is packed so if you do not see them just ask. Let's see where were we.....I think this brings us up to my big leap of faith. In 2009, after a hiatus from working for someone else, I began to job hunt. Between the big crash, and not finding anything that really interested me, things were going no where fast. I began to ponder, could I make a living with Beadware? That October a local farm was holding a harvest festival and were looking for vendors. Hmm. Could I? I had no outdoor set up. But luckily, my old Beads and Bubbles cohort and I had visited outdoor art fairs to take notes and get ideas. We were pondering our options. And then I moved. In September I dusted off those notes, got online and started shopping.You may be surprised to see that my very first outdoor set up uses many of the same components I am still using. I did a trial run in the backyard. October was here before I knew it. Here is my very first booth at a public event. My sister suggested I try the Fremont Sunday Market in Seattle. I made the commitment to try it for a year, rain or shine. While in the end it did not pan out financially, I would not trade that experience for anything. I refer to it as vendor boot camp. Putting your booth up every Sunday, tweaking, learning, networking with other vendors, making new artist friends, learning how to work with customers, etc. For several shows I even did a shared booth, but I quickly out grew that. Here is an early booth, a shared booth and a booth towards the end of that year. That experience gave me the confidence to start doing other shows. That first year I participated in 49 events. Crazy!! I have learned what shows are a good fit and now do 20 - 24 events a year. I have started to do some wholesaling. That is a whole new world! In 2013 I took a business refresher course. Last year I began taking some metalsmithing classes in the hopes of adding some new techniques. The challenge I have been having with that is time! Of course my work itself has changed over the years. I now do much more work with stones and less with bright colored glass beads. My techniques have become more precise and better quality. You can browse through the galleries of past work on my website to see how things have changed. My photography skills have also improved over time. In my last post I said this was the final chapter, but that is not true. There is still more to come! Thanks to all the friends, family and customers who have come along with me on the exciting ride. After the first sale and going thru the process of incorporating as a sole proprietorship, I teamed up with a good friend, Maria, who had started a soap making business. We held our first joint sale that following summer in my home. My initial "look" was one of bright colors and whimsy. I used a piece of clip art for my logo. I choose a font that I felt reflected that theme and created business cards, tags, signs and sale post cards. By that fall, Maria had incorporated her soap business into Earth Essentials and had plans to expand into other types of personal care products. We enlisted the help of my neighbor, a graphic designer, to develop our next iteration of sale flier. She coined the phrase "Beads and Bubbles" and our sales were called that for several years. My home was situated in a strategic location, excellent for folks to stop into on their way home from work on a Friday. We'd add another artist here and there for variety. I would enlist the help of a friend or 2 to work the floor and Maria and I would run the check out. Folks would hang out in the living room sipping wine with friends after a long week of work. We were a hit! Then I decided to make the move to the west coast. We had a final fling to help me reduce my inventory. I have not had a sale that big since! Friends clamored for me to return, so I would go back once a year (usually before the holidays) to do sales in other peoples homes. I had planned ahead for this and left a set of display items with a friend. I would pack all my jewelry in a carry on suitcase. Boy did I get wacky looks from the TSA scanner folks when all those little pieces of metal showed up on the screen! After a few years I started doing holiday sales in my new home. Those early sales were a challenge, as I was still building a following and my new house was a destination instead of on the way to somewhere. I usually tried to find someone to partner with, that had a larger list of friends than I did. And mother nature threw me some challenges, in the way of storms and no power! But I did not give up. After couple years I added a spring sale and began to expand my list of other artists to include. Sales unusually had 4 to 6 artists. I even had demos and live music. At the same time I opened an online store in Etsy. This year is Beadware's 15th Anniversary. I have been beading for much longer than that, but it was 15 years ago that I incorporated and became an actual business. My records go back to the date I incorporated and it is fun to look at some of the to-date numbers. For instance, I have made 5257 pairs of earrings, 1236 necklaces and 1509 bracelets. The crazier part is over 90% of those have been sold! I began beading when I was a teenager. I liked making things for myself and as gifts for friends. Seed beads and daisy chains were all the rage (does that date me?) I used to order supplies from Gloria's Glass Garden in Berkley CA. I still have an example of the "groovy" packaging and one of the daisy chains. As I got older, my interests changed and the beads got packed away. Many years later my interest in beading was re-ignited when I came across that box of beading supplies tucked away in a closet. Naturally I had to dive right back in! I gave things as gifts to friends and family. Looking back at photos, I realize how nice my friends were because some of that work was just plain awful! But I continued on and with practice improved my skills and designs. After many years of giving my work as gifts I ventured into the world of the small business entrepreneur and Beadware was born. I was between jobs and someone suggested I try selling my wares. I sent out invites for a December home party to everyone I know and worked for a solid three weeks making things. I was amazed at the response. Here are some photos from that first show. After the first of the year I visited my local Small Business Administration office to learn how to become a business. Beadware was incorporated soon after that. Tune in tomorrow for part II. Side Door Pottery is another of the great artists you will meet at my studio sale on May 13 & 14. If you have been to one of my studio sales in recent years you would have seen her work. 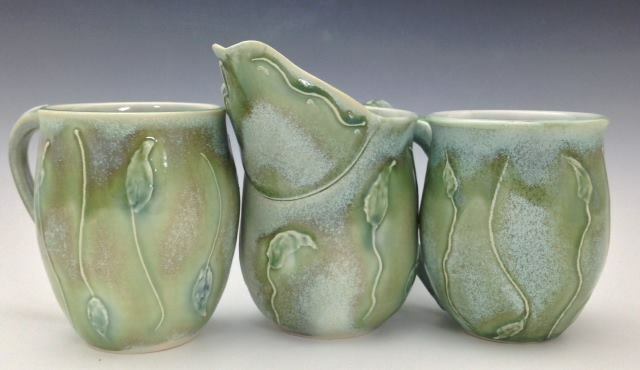 Side Door Pottery is whimsical painted porcelain that is functional and sculptural. All hand painted and one of a kind. Plates, bowls, cups, serving pieces and pitchers. Tiles and sculptures. Bird houses and feeders, garden stakes and birdbaths. There is something for every taste. You can view many more of Linda's creations on her Facebook page. You can also see her work at local galleries in Port Orchard and Poulsbo as well as the Port Orchard farmers market. A quick post with a few photos of some new earrings you will find at my upcoming show in Wenatchee and my Spring Studio Show. All have SOLD.